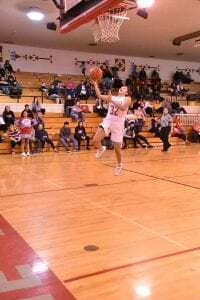 Before the Lady Braves swept Stanley County with a 81-43 victory, the “Gents” battled it out in a nail-biting overtime for a 73-72 three-point buzzard shot win. 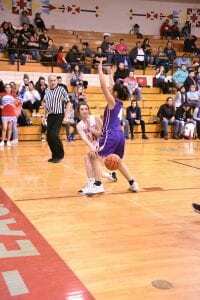 Senior Naden Saucedo, who has been on fire with his three-pointers this season, received a full-court pass, turned and shot the ball after Stanley County wen up by two with a free throw shot and only 3 seconds left in overtime. Sophomore Rance Harrison and Senior Cecelio Montgomery were leading scorers for C-EB. 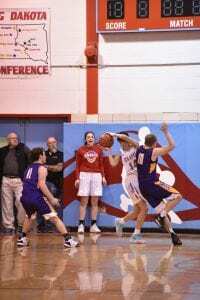 The Braves exploded down the court against Stanley County who stayed hot on their heels throughout the game, as both teams jockeyed for the lead. 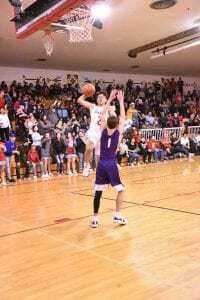 Fans for both schools were on the edges of their seats as the game intensified into overtime, and the C-EB crowd and team burst into cheers as Saucedo’s shot sank through the net. The Lady Braves also burst into action from the tip-off and took a decisive lead early in the game. 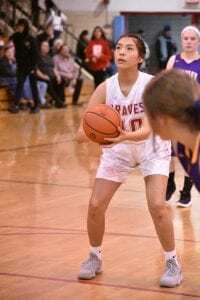 Senior Reese Ganje lead the Braves in points, scoring over 20 points, but was assisted on the board by 10 of her team mates, including Juniors Mia Paris and Markee Shaving, Seniors Justice Fire Cloud, and Jayden Hollow Horn, Junior Ka’Bryni Hall, Senior Phannette Gray, Sophomore Lynda Charger, Juniors Sunni Dupris Julia Spoon Hunter and Cooper Marshall and Sophomore Jay’Ellen Red Fox. The solid contribution to the point total be so many of the C-EB Braves and the man-to man, full press defense early in the game kept Stanley County from gaining any traction in the game. C-EB boys are first in Region 6 and the C-EB girls are third in Region 6. 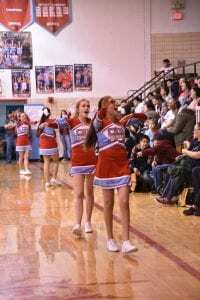 As of press time, the boys have only three losses and the girls have only five losses for the season. The teams play on Jan. 31 against Standing Rock and Feb. 2 against Winner at home. Carrissa Stocklin and TC Lawrence cheer for the boys.